Starting with Citrix XenApp and XenDesktop 7.13, Citrix has introduced a new technology called HDX Adaptive Transport. To the benefit of all that are considering upgrading to XenApp and XenDesktop 7.x or going through a new Citrix deployment, this blog will shed light on what adaptive transport is, why it was introduced, how it works, its benefits to Citrix customers, and why performance monitoring of adaptive transport is important. What is HDX Adaptive Transport? Adaptive transport is not to be confused with adaptive display, which is a graphics stack that makes use of automatic real-time decisions to apply video encoding for select portions of the screen with video content. On the other hand, adaptive transport is a protocol that is designed to transmit data quickly and more reliably. It does not change or replace HDX. It, actually, is the underlying transport protocol that carries and delivers HDX sessions to Citrix users over UDP or TCP. While TCP is, generally, the de facto choice for VDI content delivery, Citrix adaptive transport uses an enhanced version of UDP as the primary data transport protocol. This is called Enlightened Data Transport (EDT), and this works over UDP. EDT was introduced in Citrix XenApp and XenDesktop 7.13 to overcome the shortfalls of environments that do not support TCP well. For example, on long-haul WAN connections where there is possibility of high latency and fluctuating bandwidth, EDT would be the preferred transport protocol over TCP. It improves data throughput for all ICA virtual channels including Thinwire display remoting, file transfer (Client Drive Mapping), printing, multimedia redirection and others. Given the faster and more stable performance it provides, starting from XenApp and XenDesktop 7.16, EDT has been made the default protocol for HDX content delivery. Adaptive transport has been built with the intelligence to automatically understand network conditions and react to changes. By default, XenApp and XenDesktop now deliver HDX content via EDT. Based on a dynamic determination of conditions where TCP would perform better, or should the network not support UDP, or in the event of an EDT failure, the transport falls back from EDT to TCP automatically, in real time, ensuring seamless and uninterrupted session connectivity for the end-users. EDT will benefit any type of Citrix session – from sessions that are highly graphic-intensive or video-rich, to less intensive, standard desktop applications. Adaptive transport is configured on the XenApp/XenDesktop VDA by applying the Citrix policy before it is available for communication between the VDA and Citrix Receiver. If adaptive transport setting is configured to “Preferred,” then the use of EDT vs. TCP will be driven by Receiver. Framehawk is not supported on EDT as it uses its own UDP data transport layer. As adaptive transport and EDT have become the standard data transport protocol for XenApp and XenDesktop, almost all Citrix sessions delivered through it. With such extensive customer impact, monitoring the performance of sessions that use EDT becomes important for Citrix administration teams. Before an end-user experiences a problem on an EDT session and complains, Citrix admins need to have the capability to continuously measure EDT performance and connectivity, and isolate bottlenecks for proactive troubleshooting. Key EDT performance metrics include bandwidth, roundtrip time, congestion, packet retransmission, sent/received acknowledgements, and so on. 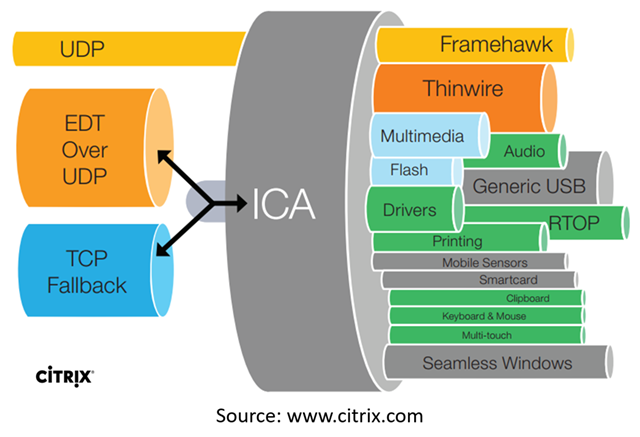 While ICA channel insights (screen refresh latency, Framehawk, etc.) 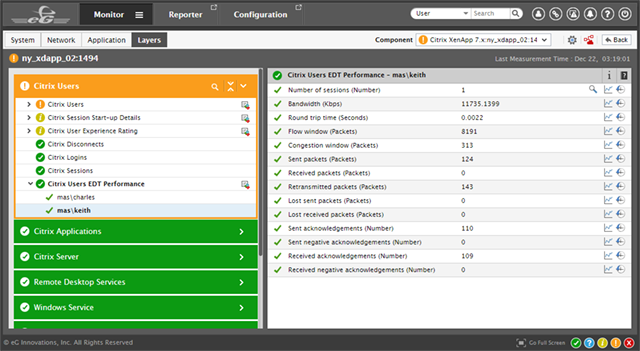 tell us about the real-time user experience that Citrix users encounter, EDT metrics indicate how fast and reliable the EDT transport has been for end-users. Citrix admins need visibility of these KPIs for each and every session running on EDT for end-to-end Citrix performance management. 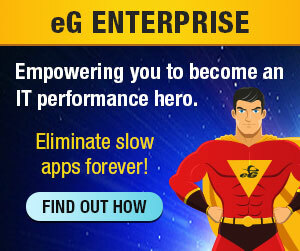 Starting with v 6.3, eG Enterprise automatically discovers the sessions that are using EDT for transport and tracks EDT performance metrics for each of those sessions. This capability is supported both for Citrix XenApp and XenDesktop sessions.